Waheguru Ji Ka Khalsa Waheguru Ji Ki Fateh. Hukamnama today is in Gujaree Kee Vaar by Guru Arjan Dev Ji on Ang 523 and 524 of Sri Guru Granth Sahib Ji. aadh - even before you were born; madhh - whilst you are alive;anth - even when physically your death comes;paramaesar Rakhiaa - that light of the world;rakhiaa - looks after you. If there is one friend who is there in the beginning, in the middle and beyond the end it is Akaal Purakh. That is what Guru Arjan Dev Ji is beginning the Shabad with. Sachey Paadshah is saying Aadh Madhh Ar Anth paramaesar Rakhiaa And if we look at this slightly deeper – even before the aadh the beginning of this world; madhh now within this life we know and anth even what we know that creation will be destroyed, rakhiaa even then God will keep us in his lap. There is something that goes beyond time, something that goes beyond body, something that goes beyond physical elements, there is always something that will keep us in his arms. That something, that feeling, that power that God will keep us with Waheguru, Akal Purakh. How you have felt this feeling of protection everywhere you go, Dhan Arjan Dev Ji Maharaj says,sathigur - the eternal Guru Guru Ram Daas Ji Maharaj hasDhithaa - blessed me with har naam - with the name of God. When Guru blessed me with the name of God, anmrith Chakhiaa - that is when I tasted immortality. Saying the word Waheguru again and again, the Guru’s Mantar, the Guru’s word that Guru has given to us is not mechanical repetition. Saying the word Waheguru again and again awakes our inner Amrit. Saying the word Waheguru again and again awakes the Amrit which is inside us. That taste of immortality that we are looking outside is within us, but we will not be able to look inside us, without the Guru giving us those eyes, giving us the ability to look within us. Sathigur Dhithaa Har Naam - when the Guru blesses us with Naam, when the Guru blesses us with the name of God, i>anmrith Chakhiaa that is when we taste immortality. That key to the path, the door of your soul, that door when it opens the God you will see running through each vein, running through each breath, that key is the Guru’s Shbad, Guru’s word. Meditate on the Waheguru Mantar again and again and you will taste the Amrit inside. So the Guru blessed us with the Naam, the Guru blessed us with Gur Mantar, then what do we do? Saadhhaa Sang Apaar I went into the apaar - the limitless, the bountiful Sang - Sangat - the congregation of the saints - Saadhhaa. Those people that within or with their mind, who are meditating upon God I went and sat with them. And then what happened?Anadhin - day and night Har Gun Ravai - they told me to immerse myself.Ravai - to sing and praise the har - Waheguru, Hari ; Gun - praise Anadhin - day and night. Whenn you go into the Sangat that is where you feel the motivation, you feel the inspiration. And you get the preparation to sing the praises of God day and night. If you cannot sing the praie of the God for one hour, for half an hour, for 5 minutes, then how are you going to get onto 24/7. Sitting in the Sangat is a way of preparing your mind, and you may have felt this. When you go into Gurdwara, sometimes you feel very, very dejected, you feel very, very depressed, but when you sit in the Sangat it picks you up. Saadhhaa Sang Apaar Anadhin Har Gun Ravai - Going into the Sangat inspires you again and again it inspires you with the name of the God. This hasn’t been realized by me, this is something you notice in souls who become enlightened. Kabir Sahib Ji says mayraa muJh may kuchh nahee - nothing is mine;jo kuchh hai so tayra everything belongs to you. Again and again inside Gurbanee you have Guru Sahib saying kaho nanak sub tayree vadaaayee everything is your greatness; koyee naam na janay mayraa - nobody even knows my name. sabh kishh - everything; karathae Hathh - is n the hands of the creator;kaaran Jo Karai - Waheguru is the one who is the cause of all causes. In fact to put it into slightly colloquial way – Waheguru is the one who rolls the dice, Waheguru is the one who chooses what the outcome will be. Waheguru is the one who has done this. At this stage of realization, that soul is saying everything is in His hands. It wasn’t me who got hit,it was him who brought me. That Waheguru who has Oupaaeiaa - created you This No Mann Vasaae; Vasaae - literally means live within. Let that Akaal Purakhh who has created you dwell inside your mind -mann - within your mind. And the way we pronounce this – theman does not have a Sihari, or a Tippi. Without Tippi it says man. With the Tippi it is pronounced mann. That means within your mind, in your mind let Waheguru dwell, make space for Waheguru inside your mind. The one whoo has made your whole body, dedicate your mind to him. Then we ask Waheguru if we meditate upon Waheguru name then jin jan those humble beingsDhhiaaeiaa - meditated upon Khasam - Lord Waheguru Thin Sukh Paaeiaa - they have found peace. There is no other way to find peace and happiness. Those people who follow what the Guru says, Guramukh - those who keep their face towards Guru, their Janam - their life, their birth issafal - blessed, is fruitful. Paravaan - it is accepted. It is approved. Their lives are worth living, their lives are beautiful. Their lives give inspiration to countless. When they realize theHukamai - command of God, when they realize everything is happening in God’s command; realizing it and not “I know it”, pretending to say with their lips but realizing it. Realization means to feel it inside. The realization that everything is in God’s Hukam and the realization would not come unless we follow what Guru Arjan Dev Ji says in the first line of this Salok. Maharaj Ji says This No Mann Vasaae Jin Oupaaeiaa Enshrine God inside you. When you enshrine God inside your heart, soul and mind then you will Hukamai Bujh then you will recognize, then you will realize the will of God. Nihaal That is the day all your pains will go away. haal means pain, Ni means without; Bujh means gone. That is the day you will become pain free. Khasam Furamaaeiaa - when you realize everything works Furamaaeiaa - In the command of Khasam the Lord, the master. That person who is blessed with the kirpaa - grace of Waheguru, s neh Bharamaaeiaa that person does not wonder. Maharaj Ji is saying someone who lives with the command of God Jo Jo Dhithaa Khasam - whatever Waheguru gives him or her they accept that as Sukh - as happiness. Whatever Waheguru Ji gives. Bhaanvai theerag Bhaanvai Dhakkai Ek Vadaaee dai Inside Guru Granth Sahib Ji it says, even if you give me happiness, even if you give me pain, even then the only glory of my life has to be attached to you. Guru Nanak Sahib Ji says in Japjee Sahib, Kaitiaa Dookh Bhookh sadh maar Eh Bhi Daat Tairee Dataar Waheguru evenBhookh - hunger, even pain - , even that is your gift. 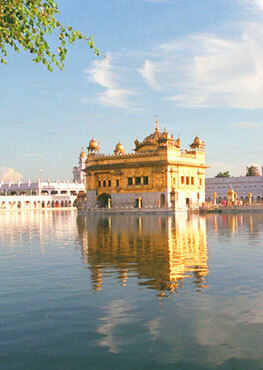 Living within Hukam, realizing it, not just to say with your tongue; living in Hukam is a state of in a being. First meditate upon the name of Waheguru, enshrine God inside your heart, when you enshrine God in your heart that is when you recognize , realize Hukam. And this idea of realizing the Hukam is not just speaking about the Hukam but realizing the Hukam. Realizing the will of God, it comes up in the Guru Granth Sahib again and again, Jeenee Pachhata Hukam, or in Japjee Sahib,Hukam Rajaaee Chalna; Nanak Hukamai jai Bhujjai; Bhujjjai; - to realize. Not just to understand it mechanically but to feel it inside. Jo Jo Dhithaa Khasam Soee Sukh Paaeiaa Those people even accept hunger as a gift of God. Those people even accept pain as a gift of God. Those who Waheguru Ji causes himself to wander off the path, Mar Mar - they die again and again. Jamehi Nith - and they are born again and again. Those people who slander,Thathakaal - Maharaj Ji says inn an instant they areMaarae - destroyed. Now destruction simply does not mean physical destruction but mental and spiritual destruction. Khin Ttikan N Dhithae Whatt type of destruction? Khin - even for an instant they findTtikan N Dhithae - no place of rest. They cannot any place to Ttikan is a Punjabi word means rest. As soon as that maggot of slander enters into someone, it does not let anyone rest. God cannot take,Khav - literally means to endure; Waheguru Ji cannot endure the pain of his servants. Farr Jonee Juthae Waheguru takes those people who slander his servants and Maharaj Ji says , Dhan Guru Arjan Dev Ji says that God puts them into the cycle of reincarnation, into the cycle of birth and death. Guru Arjan Dev Ji Sachay Paadshah Ji is painting such a vivid picture. Akal Purakh Jii holds them by their head and Jam Maarag Muthae and Waheguru Ji makes them to walk upon the path of Jam Maarag - die again and again and again. Bilalaaniaa means to cry out; they feel the pain of these maggots eating them through their slander. Narak Ghor Suthae and they are thrown into the deep states of hell. Maharaj Ji says Ghor Suthae Their life is like that as well. Someone who slanders other people that person’s life is never peaceful. Ttikan N Dhithae that person will never find any peace. Dhan Guru Arjan Dev Ji says Waheguru Ji is the eternal truth. Waheguru Ji keeps his servants closer against his neck, in his embrace. So Guru Peaario one side is of Nindeeaa and the other side is following Guru’s path. That is what Guru Arjan Dev Maharaj Ji is telling us.